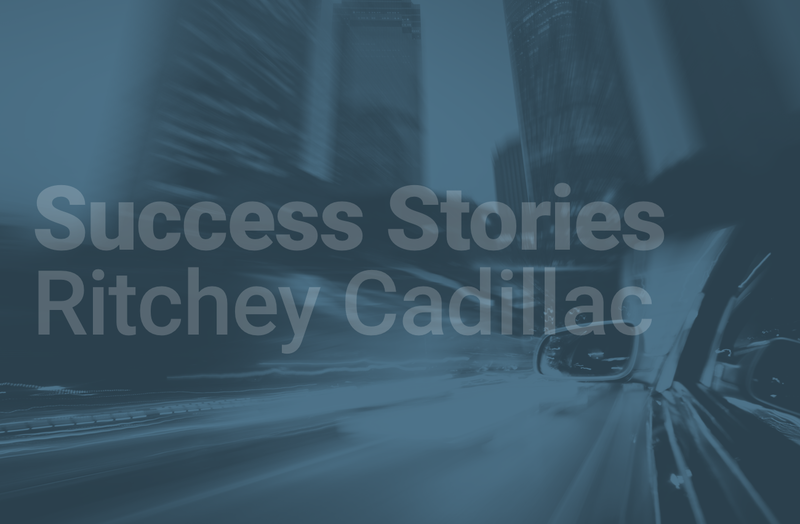 We had a chat with Rich Rogers, from Ritchey Cadillac, about their success with the VehicleXchange™ tool and how it effects their daily buying and selling processes. Hillis Emanuelson: How would you say VehicleXchange™ has impacted day-to-day operations at the dealership? Rick Rogers: VX gives me a lot of information on equity, credit, what kind of car they are driving, how much their payment is, and it is getting people in the door. There are different focused cars that we do every month, and I have quite a few different campaigns, sources of leads. I try to divvy them all up as good as I can. When I have the lease pull-forwards, I need to focus a lot on that, but I try to keep up with my VX also. It’s just a lot for one person to keep up with. H: What’s the structure like there? R: I depend on my sales guys, and I don’t give leads to everybody. I just give them to the ones that I hear using the script correctly, there are four other people that will actually make calls, make notes, and try to do something with them. H: Tell me about the process around the campaigns you run and how you alternate your focuses. What are your primary focuses right now? R:For example, on the Escalade, they have a private offer that General Motors sends out to current Escalade owners that they are offering $7500 and sometimes over 10,000 dollars towards the purchase or lease of a new Escalade. This is just unheard of and it is a great deal. Then you’ve got your lease pull ahead; the lease pull-forwards will pay the last four payments up to $2500 allowing them to get out of their old car and into a new one. Now that’s Buick & GMC. Cadillac is four payments up to $2000 . I try to make sure we call all of them. However, then you have the service drive, and that’s like low hanging fruit, you know. If you see somebody in a lease and they’ve got 20 payments left, it’s not as important for me to call that person as it is to call that person who has A credit. They are currently in a purchased unit, your (hot) sheet says it’s got $8,000 in equity, and their paying 500 a month, those are good leads there. H: Tell me specifically for those what’s your process for working those customers, you identify them, and then what happens next? R:Then I go into VinSolutions, which is our CRM, I call it “Customers Really Matter.” I look at the history of that customer and see if they worked with anybody before. It may say lost lead from 2016 from when we tried to sell that customer a car and for whatever reason they didn’t buy, but they were working with so and so. Based on that, I will assign that hot lead to Sean. You all have that feature (Rapid Proactive Messaging) that alerts us when a customer is requesting pricing. I mark that one as a hot lead, the customer requesting pricing in notes, and tell him to contact them. I take him the VX hot sheet with his name on it and change it in Vin Solutions, and I assign it to Sean, and he calls the customer and puts notes in the CRM. H: When the customer requesting pricing alerts come in do you handle those any differently or handle them the same way? R: They are handled a little bit; differently, they are treated with more urgency. When they request pricing, I mark that as hot; I print the sheet out, I take it down to whom I’m going to assign it to based on their history with our dealership, whom they’ve worked with before. H: Do you like that Rapid Proactive Messaging (RPM) sends you real-time alerts? R: Yep! Last week on my day off I got four alerts on my cell phone that customers were requesting pricing. So, I forward those requests to our BDC manager, and I texted her and said, “Hey Debbie these four people are requesting pricing information, could you get these allocated?” She’ll go into VinSolutions and assign that customer to whom they’ve worked with before, and she lets them know we need to get on it because these people are requesting pricing. H: Are you the only person assigned to get those text message alerts? R:Yep just me. We’ve had other people in the dealership do this before me, but I’m the desk manager, and I’ve got all these different software solutions, but they trust me to work them the best. I try to make sure that everybody gets touched. H: That’s what we like to hear. Plenty of our dealers set up their entire sales team to get those alerts, and they are delivered to whom they are assigned to. R:Right but then they sit on the corner of the desk and never get work. I like to make sure that when I give them to somebody that they are going to follow up with it and put notes in there. I’m really big about leaving a trail where we left off with a customer and leaving notes. H: Tell me a bit about the performance of the tool, are you satisfied with what the tool is generating for you? R: Absolutely. VX has more information than my GM global. It may say hot lead for Buick, but it doesn’t have any information on there. VX tells me if it’s a retail or a lease, it’s got equity, if they are an A Tier credit or a B Tier credit, there’s just a lot more information. It gives me a better picture of where I’m at with a customer, to begin with. You know if the customer is driving a 13 XCS, he’s got a five-year-old car, and he’s got $18,000 worth of equity and perfect credit. That’s low hanging fruit. I want to make sure that we do something with that customer. H: Do you do anything differently with how you approach conquest customers vs. current customers? R:For conquest customers, I will pick out a customer and go into the current incentives and see what they may qualify for. We had an incentive last month where certain vehicles qualified for an additional $2750 if they owned a conquest vehicle. So, then I would call those customers and lead them in that direction, for example, the GMC Terrain and the Buick Enclave had the big conquest incentives last month. Then I would see what kind of vehicle they were currently driving and match them up with something we had the special on for the conquest. H: It’s leveraging what VX does with the matched incentives, then applying your knowledge and taking it to the next level. R: Exactly. I can’t just land on anything and not offer them the conquest cash. I have to land them on something that does offer them the conquest money. H: And do you see success there? R: Oh absolutely. We had one customer last month through VX that came in and traded two vehicles in, bought one and used the conquest money. So, he had equity and conquest money, trading two for one. H: Tell me about the inventory that you bring in off the tool. Do you take them right out to the lot and retail them or do you primarily look at them from a wholesale perspective? R: It depends, we have a tool that tells us based on the VIN if the vehicle is recommended or not recommended for our inventory. That is going off of previous sales, so not all the time is your main product going to be a recommended vehicle. Sometimes your own brand is not recommended, but another one is. A Jeep Wrangler, for example, is recommended, if I take a Jeep Wrangler and clean it up, even if it’s got 100,000 miles on it and I don’t have to spend too much money on it, I’ll put it on my lot. H: Does your inventory management tool play a part in the vehicles in your service drive that you go after? R: Not until just when I take it in on a trade. Once I take it in on a trade, then I decide what we’re going to do with it. H: One of the primary benefits of VX is sourcing inventory efficiently. If you can source a vehicle from a consumer instead of going to auction, you can obviously save a lot of money in fees. R: Yeah if I can get a used Subaru, those sell really well. It just depends on the vehicle. If I get a low mileage 10,000-dollar car, that’s like almost impossible to find, so that’s something I want to keep. However, if I get something like a ’15 CTS with 50,000 miles on it, I don’t care about keeping that car. That’s just putting a lot of money into something that’s not a hot-selling car. H: Tell me a little bit about the feedback you get about VX from the consumer? What engages them the most? R: I’ve found if we use your scripts, it works out best. If we get away from the script…you know there are so many robocalls that people can get really defensive. If you can stay on the script, book an appointment, and get them in, that works the best. H: Do you get any feedback on the emails and mailers that are going out? R: Absolutely, It has a residual effect because your initial contact doesn’t necessarily get the customer to come in and buy a car, but then two weeks later that same customer is here buying a car. So, it’s getting the word out, contacting the customer, so when they do lose sleep over it, they come in, and they usually don’t ask for the person you tell them to ask for, they ask for someone else. You can pull them up and see they were contacted and you try to get them with that person. I had one just the other day, they were contacted a couple of weeks ago, and they weren’t interested, but then here two weeks later they bought a car. H: We hear that a lot from clients. What are your goals for the VX program moving forward? R: Well you know that one month I did 30 cars off of VX, that’s my goal moving forward, I want to do 30 every month. One month I did 13, and I was embarrassed, but then again you know I’m only one person trying to work these different manifests. I like VX more than any of the other ones I’ve had, but I have to work all of them. H: Do you have any plans to grow the program as far as personnel? R: Well I would like for the BDC to help out more, but we had four of our staff go out on maternity leave, and now they are too shorthanded to help me. So, I have to depend on my salesmen, and I only have four of them that I would let use the tool. Debbie is trying to hire more people; she’s a really good manager, she stands over their shoulder and makes sure they follow the script correctly. Going forward, as soon as we hire people that can do the job, we will allow the BDC to work the program more and more. These new guys that are doing this for me, they are doing a great job, and I appreciate them. However, if they had seen 30 years ago how I did it as a salesperson, they would be blown away. I used to go above the parts department and go through the old deals and pull them out by hand. I used to stand up there with a flashlight, look through the deal jackets and write them down. The way that VX works with all of the data right in front of you, the information is so valuable, they don’t even realize what it used to be like. H: Do you have a piece of advice for fellow VX dealers that just signed up for the program? R: Do your homework. When a customer pops up on VX, look at the address and the number on that customer and then find them in your system and see their history with your dealership. If the customer has never bought a vehicle from you, but they’ve had their vehicle serviced in your service department, you go at it differently. Many times I’ll work a whole deal before I even call a customer. I give them numbers and try to get them in the door. If a customer has a history with your dealership, they already like you and want to buy from you when they’re ready. Vary your approach based on their history with your dealership. H: What would you say your favorite part of VX? R: The data. I don’t know how you guys do it, but when you put on there that a customer is an A tier, meaning that they’ve got really good credit. You can clearly see that it’s a retail deal and not a lease, and they have equity in their vehicle. That is as valuable of a lead as you can get right there; especially if the customer is driving your own product. Just tooting our own horn here: At Ritchey Cadillac, our retention rate is 57%, which is unheard of at most car dealerships. I would absolutely say that VX has played a big part in keeping our customers long-term. Originally published at www.pearlsolutions.com on June 5, 2018.